Benjamin S. Carson, Sr., M.D., is an emeritus professor of neurosurgery, oncology, plastic surgery and pediatrics at the Johns Hopkins School of Medicine, where he directed pediatric neurosurgery at the Johns Hopkins Children’s Center for 29 years. He was the inaugural recipient of a professorship dedicated in his name in May, 2008 and is now the Emeritus Benjamin S. Carson, Sr., M.D. and Dr. Evelyn Spiro, R.N. Professor of Pediatric Neurosurgery, having retired on June 30, 2013. 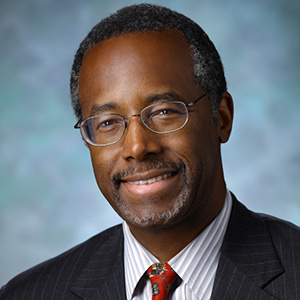 In 2001, Carson was named by CNN and TIME magazine as one of the nation’s 20 foremost physicians and scientists. That same year, he was selected by the Library of Congress as one of 89 “Living Legends” on the occasion of its 200th anniversary. In 2004, Carson was appointed by President George W. Bush to serve on the President’s Council on Bioethics. He is also the recipient of the 2006 Spingarn Medal which is the highest honor bestowed by the NAACP. In February of 2008, Carson was presented with the Ford’s Theatre Lincoln Medal by President Bush at the White House. In June of 2008, he was awarded the Presidential Medal of Freedom by the President, which is the highest civilian honor in the land. Carson was recognized in November, 2008 by U.S. News & World Report and on February 7, 2009, the award-winning movie entitled Gifted Hands: The Ben Carson Story, starring Cuban Gooding, Jr. as Carson, premiered on TNT and is based on his memoir. Carson holds more than 60 honorary doctorate degrees and has received literally hundreds of awards and citations. He is a member of the Alpha Omega Alpha Honor Medical Society, the Institute of Medicine/National Academy of Science, the Horatio Alger Society of Distinguished Americans and many other prestigious organizations. He sits on the board of directors of numerous organizations, including Kellogg Company, Costco Wholesale Corporation, The Academy of Achievement, Vaccinogen (a cancer vaccine research & development company), and is an Emeritus Fellow of the Yale Corporation, the governing body of Yale University. Carson has spoken twice during the President’s National Prayer Breakfast in 1997 and 2013. His first four books, Gifted Hands, THINK BIG, The Big Picture and Take the Risk: Learning to Identify, Choose and Live with Acceptable Risk (January, 2008), provide inspiration and insight for leading a successful life; Both his fifth book, America The Beautiful: Rediscovering What Made This Nation Great, released in early 2012, and his sixth book, One Nation: What We Can All Do To Save America’s Future, released on May 20, 2014, have made the New York Times bestseller List.